Discussion in 'Bird' started by toni, Dec 20, 2010. The Cardinals come to the feeders for the Safflower seeds, the Blue Jay drinks from the birdbaths but they don't hang around much or for long. 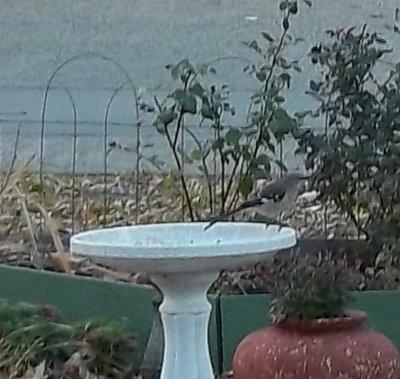 I have got a Mockingbird pair who are hanging out in the front yard now. I think they came for the pepper plant that came up in the backyard this year and I am really glad they are staying. I took an old birdbath out to the front garden, raisins and a chopped up apple in and have been having a great time watching them argue over who gets to eat. They aren't quite a skittish as they were a few days ago so I am hoping that I can get photos of both of them in a couple of days. But this evening I got lucky with one of them at least. The photos aren't really clear since I was having to hide on the front porch and use the zoom so not to scare them off. I can just make out the mocking bird. I hope that you will be successful in the coming weeks. 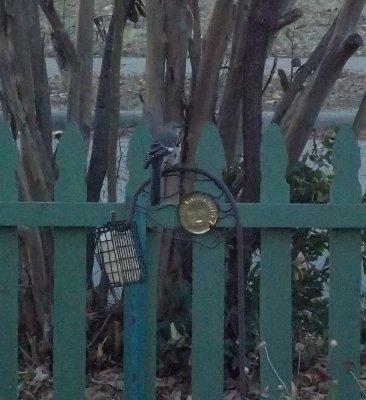 In fact I am hoping that you will eventually get pics of the rest of the birds that come into your yard. I think you did just fine Toni with the photographs you've taken. Many of my birds were shy to start off with too but now they're used to me being about. I think they associate me with food so don't mind the odd photograph in exchange for something tasty. It sounds like they like what you are serving if they keep coming. I love the hawks too but not when they eat my little finches...sparrows I have a lot of and those dirty black birds or grackles...but no, he likes the tiny delicate ones. He is here daily and I am sure other times when I am not at the window. Not much we can do about his menu choice . Have you heard of digiscoping? I would love to try it this spring. You take a scope and put a camera on the end. If I can find the e-mail, I will send it here. 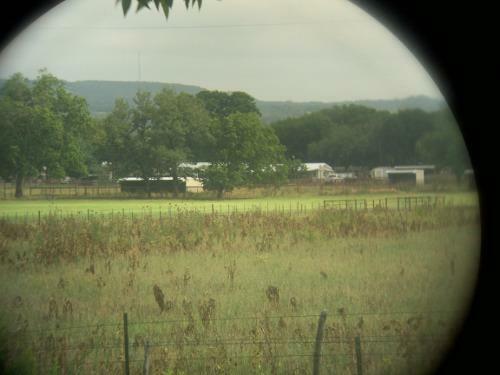 Last May when we were on our anniversary trip, hubby took a couple of photos of a farm 1/4-1/2 mile away using the binoculars as a scope. I have a pair of binoculars on the shelf right by the front door for birdwatching and it never even crossed my mind to use them with the camera.